About fifty pages into A la recherche du temps perdu – the 4000-page novel of class consciousness, neurosis, and love by Marcel Proust (1871-1922) – comes the novel’s most iconic moment. 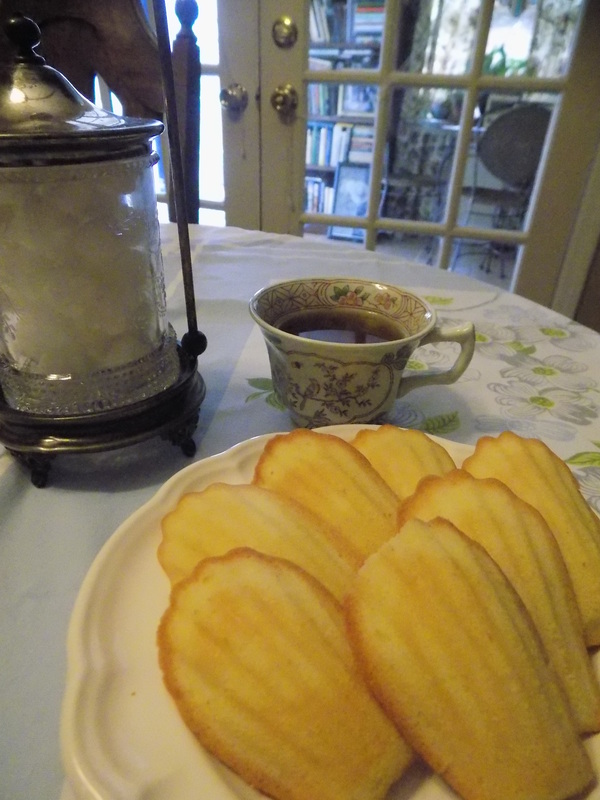 The narrator dips a madeleine into a cup of tea and that food memory stimulates thousands of pages of detailed observations and digressions about his life and the lives of those in his orbit, interspersed with philosophical reflections about time and memory. I am a life-long reader. My parents provided me with a huge collection of Little Golden Books before I could read. When I was three or four, I wandered to the furniture store around the corner from my parents’ business in downtown Tuscaloosa and independently bought a book shelf for my collection. Mr. McGraw didn’t ask questions — he just put it on my parents’ account. From elementary school, I usually had at least a couple of books working at any given time and summers were always for reading, in addition to riding my bike to Baker’s Candy Shop, listening for the popsicle man, and hanging outdoors. The reading habit continued through college, graduate school, a theatre and academic career, and beyond. I read a lot of serious fiction, but was also partial to history, essays, and other non-fiction, especially biography. Lately, my reading has tapered off – not by choice but by time and necessity. I still read daily and frequently, but mostly magazines and things that may be started and finished in a single sitting. Reading is still a tactile experience for me – I like the feel of the object in my hands, the ability to dog-ear a page with a passage to which I want to return, the compulsion to underline or write a comment in a margin. My library is still a bound one on book shelves and not one I retreat to on a sterile small screen. I decided to tackle a long-time mission this summer and start to read all of Marcel Proust’s sprawling early 20th century novel in seven parts. 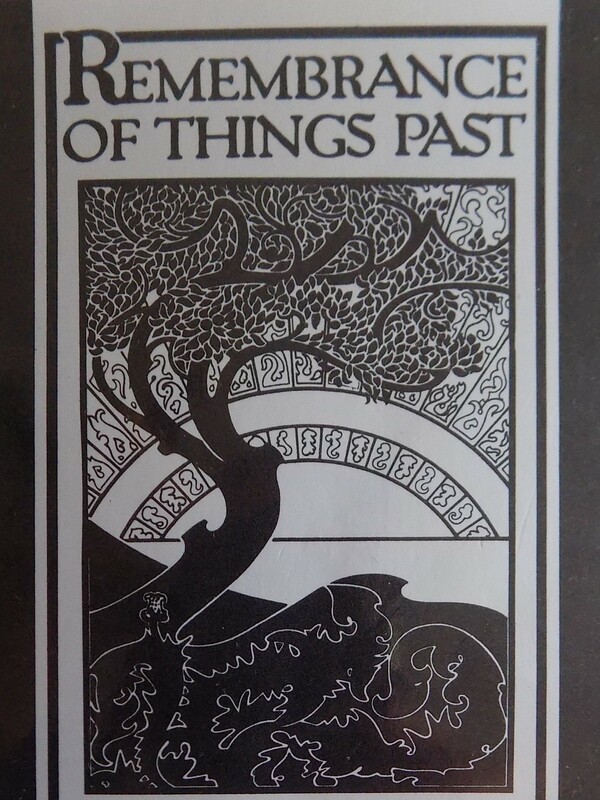 The preferred and more accurate translation of the title is In Search of Lost Time but the most popular English translation is C. K. Scott Moncrief’s Remembrance of Things Past. I am partial to Moncrieff’s (inaccurate) title because of its reference to Shakespeare’s Sonnet 30. Proust’s novel has been referred to as the literary Mount Everest. I’ve read bits and pieces over the years and frequently refer back to the “madeleine moment” which stimulates my ongoing interest in food memory. I’ve skimmed through other sections of the work and remember an overwrought 1984 film adaptation of the novel’s “Swann in Love” episode starring Jeremy Irons. I was immensely moved by playwright Harold Pinter’s film adaptation of the sprawling work, published as The Proust Screenplay in 1977. The film, which would have been directed by Joseph Losey, was never produced, but the haunting – and skillfully taut and compressed – screenplay is beautifully rendered and evocative of the prose that inspired it. I still long to see the film if it’s ever made but I doubt that it has a chance with contemporary audiences and tastes. The lush, deliberate, and lyrical prose of Proust’s novel is out of fashion in our dismal age of texting, twitter, Instagram, and Facebook. When I first tackled a complete navigation of the book this summer, I wasn’t sure I would make it. As of today, I am only about a third of the way through, but I am compelled to move forward and determined to complete my task; each day it becomes more of a pleasure and less insurmountable. The thing that I never realized in reading random and isolated fragments of the novel is just how frequently funny Proust is. To read the novel as a whole is to go through a master class of literary composition and style. Proust engages in pages of precious and immaculate description which follow dozens of principal characters and hundreds of supporting roles. His social satire sneaks up on the reader until its anticipation becomes part of what compels the reader forward. The passages about the faithful “clan” of the Verdurin household and Mme. Verdurin’s stranglehold on her little band of acolytes are as funny and biting a comedy of manners as the early and most wicked works of Evelyn Waugh (like Decline and Fall and Vile Bodies). I rarely laugh out loud while reading novels but I have laughed many times during my summer of Proust (which seems destined to become a fall of Proust and perhaps even the year of Proust). Finally, after years of resisting the urge to read Remembrance of Things Past in its entirety, it feels like I have reached the time of my life in which its exploration of art and time and memory and nature, love and jealousy and the fragility of life, self-doubt and self-examination and what, ultimately, is the meaning of our brief time on the planet have a resonance for me that I have missed in the past. It’s well worth the effort. You should read it some time. Find the time of life that’s right for you. This entry was posted in A la recherche du temps perdu, Marcel Proust and tagged A la recherche du temps perdu, C. K. Scott Moncrief, Evelyn Waugh, food memory, Harold Pinter, In Search of Lost Time, Jeremy Irons, Joseph Losey, Marcel Proust, Proust's madeleine moment, Remembrance of Things Past, Swann in Love, The Proust Screenplay on August 17, 2018 by gedwardjourney. I have a bone to pick. As I write this, we are less than a month into astronomical summer but everywhere I look and listen lately people are talking about the end of summer and I’m sick of it. I love summer and feel like I have barely had a chance to enjoy the season yet. I refuse to accept its end when a bunch of fourth graders hop on buses for the first day of school (which is now criminally early). Labor Day is a holiday of the summer, not a fall holiday. The start of football season marks the final weeks of summer, not the beginning of fall. Hey! You kids! Get off of my lawn! Now that that’s off my chest, I want to talk about food. I love that story and he was right. This whole idea of farm to table and eating fresh and local is based on the availability of good ingredients and presenting them at their best, without the cook getting in the way too much. I don’t cook at home nearly as much as I used to but today I wanted to see what I had on hand, knowing that my trips to the farmers’ markets have become less regular. I did make a quick trip to a family farm stand in Birmingham a couple of days ago and bought some nice small-sized okra. The first bag of okra I pulled out today, however, had gone bad and was smelly and gross. After a shocked moment, I realized that I had discovered a bag of okra bought a couple of weeks ago that had been forgotten. The okra from this past weekend was safe, crispy, and sound in the crisper bin and ready to cut, batter, and fry up. “Food memory” is a sensation that has long intrigued me – how a smell or a taste can bring back a flood of memories. Proust’s “madeleine moment” resonates for me. A fresh cantaloupe was sitting near my okra; okra and cantaloupe always conjure up memories of midsummer lunches at my Grandmother Harbison’s kitchen table. I don’t know if it was an intentional pairing on her part, but whenever I dig into a plate of fried okra with a slice of cantaloupe on the side, I remember childhood midweek meals at the Harbison table in Fairfield Highlands. 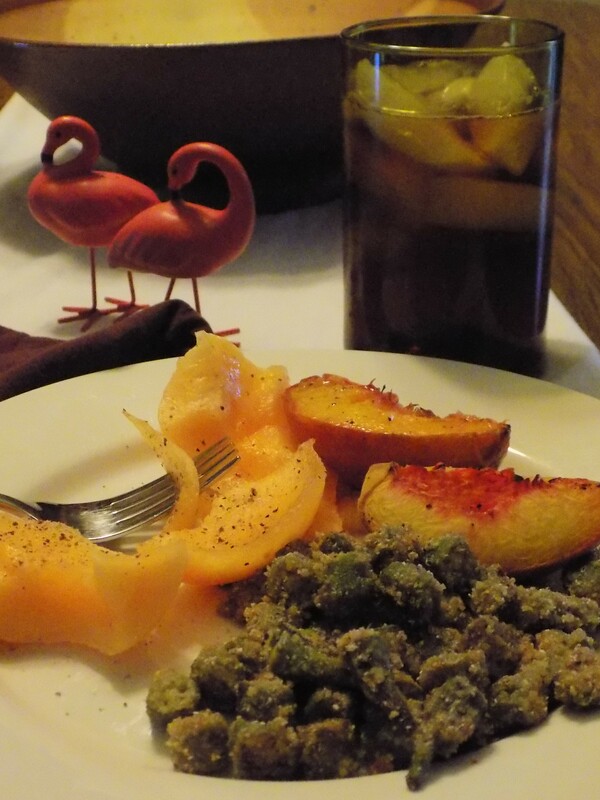 We always sprinkled a bit of black pepper on cantaloupes. I’m not sure where that practice came from, or how widespread it is, but it always seems natural to me. Conversely, watermelon was always served with a shaker of salt standing by. I had a couple of peaches left over from my most recent peach run. They were a little overripe so it seemed the best way to eat them was to grill them. I quartered the truly succulent peaches and grilled them as I finished up the breaded okra in the iron skillet. The meal didn’t take long at all to prepare but the plate of fried okra, sweet cantaloupe with a touch of pepper, and still juicy grilled peaches tasted like summer to me. It tasted like my childhood. I didn’t take the time to make a cake of cornbread and I was fresh out of fresh tomatoes, but the plate of food – accompanied by a glass of iced tea with lemon – was more than enough to sustain me on a steamy midsummer day. It won’t be fall for a while yet. This entry was posted in Southern food and tagged Eula Harbison, food memory on July 19, 2018 by gedwardjourney.